A survey of nearly 2,000 so-called vegetarians finds more than two thirds admit to eating meat on a night out – with one in three doing it every time they get drunk. A third of vegetarians admit to eating meat every time they get drunk, according to a survey. 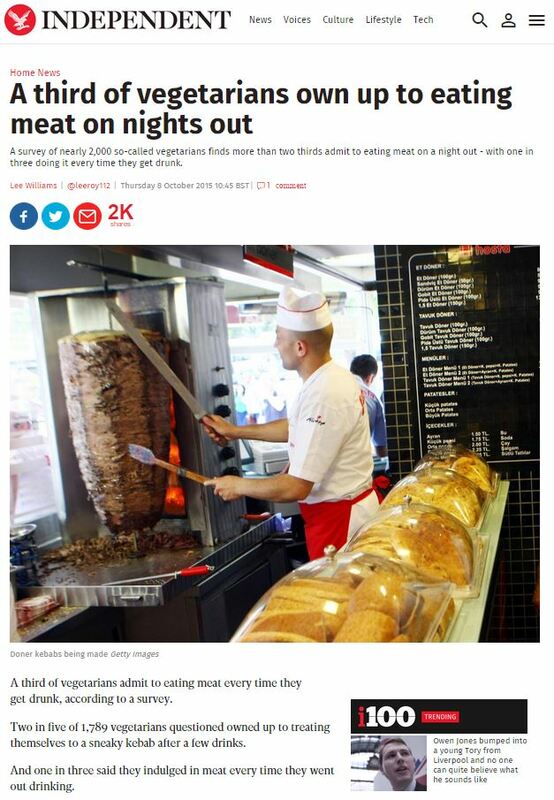 Two in five of 1,789 vegetarians questioned owned up to treating themselves to a sneaky kebab after a few drinks. A third of so-called vegetarians eat meat when they are under the influence of alcohol, a survey has found. 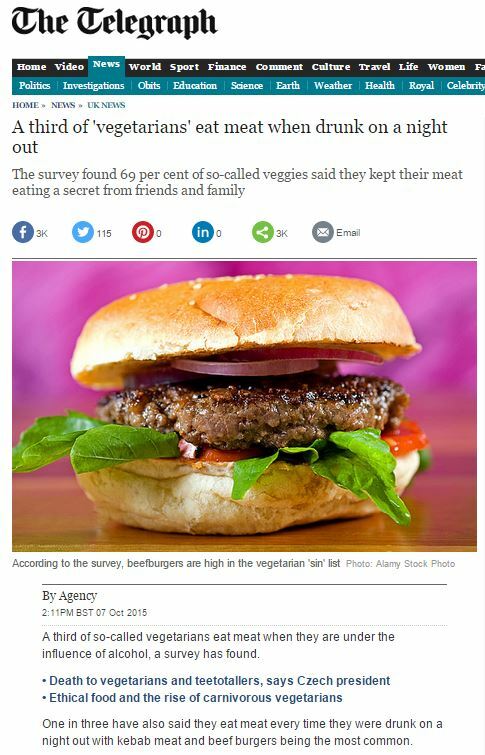 One in three have also said they eat meat every time they were drunk on a night out with kebab meat and beef burgers being the most common. Those sneaky vegetarians! I knew it all along! Surely this story has to be true, and there can’t possibly be any other explanation for how a ‘finding’ like this could appear in two national newspapers, right? The survey was conducted by money-saving website Voucher Codes Pro. George Charles, founder of the website, said: “I know a few ‘vegetarians’ who sometimes crave meat, but it seems that a few are giving into their cravings when drunk. In fact, it’s just a case of a discount voucher website trying to do anything to get a mention in the paper, just to remind you they still exist. This entry was posted in VoucherCodesPro and tagged george charles, independent, Lee Williams, telegraph, voucher codes pro on October 22, 2015 by Michael Marshall.